Between the years 2000 and 2014, there was an increase of almost 84 per cent in the number of those serving formal life sentences worldwide. 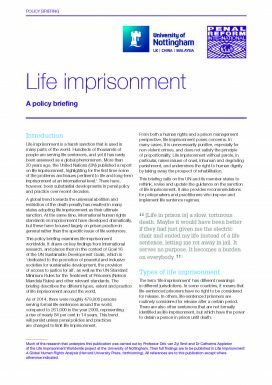 However, since a United Nations report on life imprisonment 20 years ago, there has been no international assessment of the use of and issues surrounding life imprisonment, despite substantial developments in penal policy and practice. This briefing was written by PRI and Professor Dirk van Zyl Smit and Dr Catherine Appleton of the University of Nottingham. Much of the research that underpins the publication was carried out as part of the Life Imprisonment Worldwide project at the University of Nottingham, the full findings of which will be published in Life Imprisonment: A Global Human Rights Analysis.